The Shinnecock Nation celebrated its 72nd annual powwow in the Hamptons with a four-day gathering this Labor Day weekend, that included over a hundred vendors that represented different nations from all across America, nightly fire-lighting ceremonies, live presentations of clothing hand-weaving and dancing. It is one of the largest Native American gatherings on the East Coast. The moment you walk on to the reservation, all five of your senses are immersed in the nation’s culture. The smell of the delicious traditional foods is strong enough to make your mouth water with cravings. One of their many delicacies is fry bread, a sort of funnel cake but with different fillings such as turkey, steak and cheese. Another delicious item available was charred corn on the cob. Legislator Bridget Fleming, a representative from Suffolk County’s 2nd district, said she attends the powwow every year. Marisol Velasco, of the Caribbean Taino tribe, drove about two hours from Connecticut to attend the powwow. Her parents are from Borinquen, Puerto Rico. She is one of the few Taino beaders in the U.S. and makes rosettes. Your ears are immersed in the beating of the drums, the beautiful chants and songs from the Shinnecock Youngblood singers. The dance performers included the Tlacopan Aztec dancers and Hawaiian dance performers. The jingle bell dresses take on a life of their own, singing as they move to the beat of the drums and chants. The men’s dancing is just as captivating, with men covered in eagle feathers, which is strongly revered in Native American culture and is a sign of honor for the creature. The Shinnecock Indian Nation tribe’s history goes back to the 1600s. During those times the tribe survived through fights between the Dutch and English. In 1978, the tribe went to court to file a petition for recognition. It sued the Department of Interior in 2006 after the tribe received no response following its initial petition. After a 32-year long struggle for recognition, in 2010, the Shinnecock Nation was finally recognized by the Bureau of Indian Affairs. 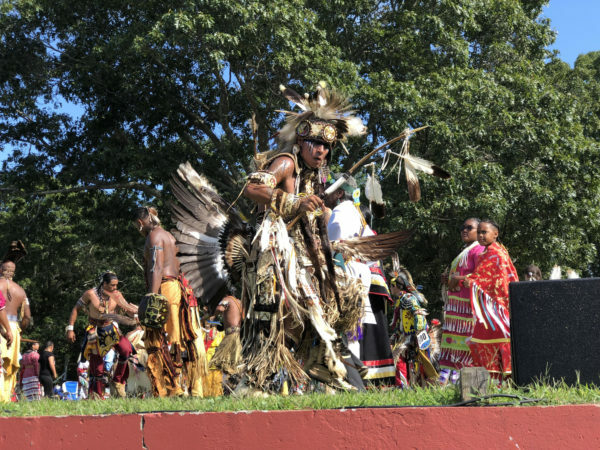 The Shinnecock Nation Indian powwow proudly demonstrates the strength and determination to keep Native American culture pure and alive, becoming a shining beacon of culture in the Hamptons area.